You might be asking why one would want to use flowers, seeds, and herbs for skin care. I totally understand. To some, it must seem a bit odd. But stick with me, because the vibrant flower you see above contains skin-loving goodness. Its dried seeds make a powder that may not be much in the way of eye candy, but can be a whole lot in the way of skin pampering. Today, we're going to take a look at the lotus flower (INCI: Nelumbo nucifera) and examine why it holds such high regard in the world of Ayurveda. In India, the lotus is the most sacred of plants and a symbol of spiritual development. Its powdered seeds and roots have a history of Ayurvedic use – for example, to help balance nerves, soothe and calm the mind, provide inner strength, and even to combat stuttering. (I'd love to find a few scientific studies on whether or not that last one has any bearing). Lotus seeds are so full of oomph that the dried powder comes with cautions and warnings such as 'do not use undiluted' and 'maximum concentration of 10%'. In short, the powder packs quite a punch. There's more too - but I'm sure you get the picture. 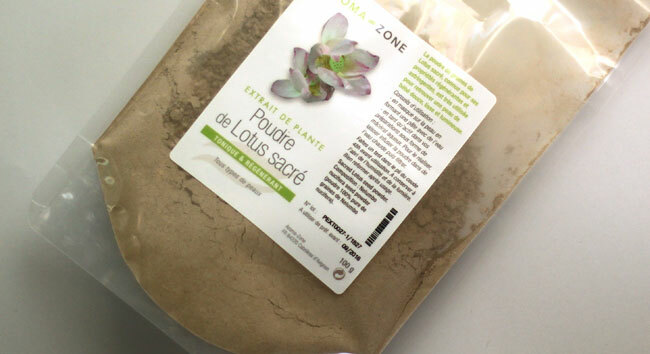 Lotus powder provides a refreshing, astringent experience that leaves skin smooth and glowing. It also offers toning, balancing, and regenerative properties. For problem skin, it's a powerful aid to battling bumps and spots. Some claim it helps acne, but there are no studies on this. Looking at its components (zinc compounds and alkaloids), it is awfully tempting to conclude that there could well be something to these claims. Combine lotus powder with green tea, orange blossom, lemon, and/or linden for a synergetic effect. Powdered lotus seeds aren't much in the way of looks, but both the price tag and the claims indicate these looks could be decieving. I hope to discover this as I work more with this ingredient. Try my no-soap, ayurvedic powder face brightening cleanser right here. Have you worked with Lotus? What are your experiences? How did it work best for you?